When you think of the word “adorable”, it wouldn’t be a surprise if one of the things that will pop up to your mind would be the girl group named OH! MY GIRL! Stepping foot into our sunny island on 5 May 2018, it marked the girl group’s first press conference in Singapore. The charming girls took their place on the stage, as they radiated off positive energy to the crowd. To start off the press conference, the group was asked about their reactions to the Banhana subunit's first title song, "Banana Allergy Monkey“. I thought that the song was fresh and different, so I wanted to try the concept out," said Hyo Jung, who is one of the three members of the subunit. Binnie shares that she is at the age where she is still able to explore with this concept, and hence she wanted to try it out as well. With Hyojung, Binnie and Arin consisting of the subunit, the song is not only cute but an absolute bop! The charming girls took their place on the stage, as they radiated off positive energy to the crowd. To start off the press conference, the group was asked about their reactions to the Banhana subunit's first title song, "Banana Allergy Monkey". Next up, the girls were asked about their wishes for variety shows. “In order to show you the real sides and charms of OH! MY GIRL, a reality show that is not scripted and shows the real us will be the type of reality show we want!” implored Seunghee, who is known as the powerhouse vocal of the group. When it comes to this group full of girl crushes, they love to explore more areas of their own talents. Mimi, the rapper of the group, would love to improve on art and drawing, while Binnie would like to try out acting. Hyojung is interested to learn an instrument, such as a piano or a guitar. As this is OH! MY GIRL's first trip to Singapore, we were intrigued by what they thought of our country, and where they would want to visit during they stay here. “Singapore was one of the countries I wanted to go to, and one of the places I want to visit is the Universal Studios! I saw a sneak peek of the ‘Merlion’ on the way to the hotel and I am also curious about the Night Safari!” YooA professed. as she spoke animatedly about her thoughts. 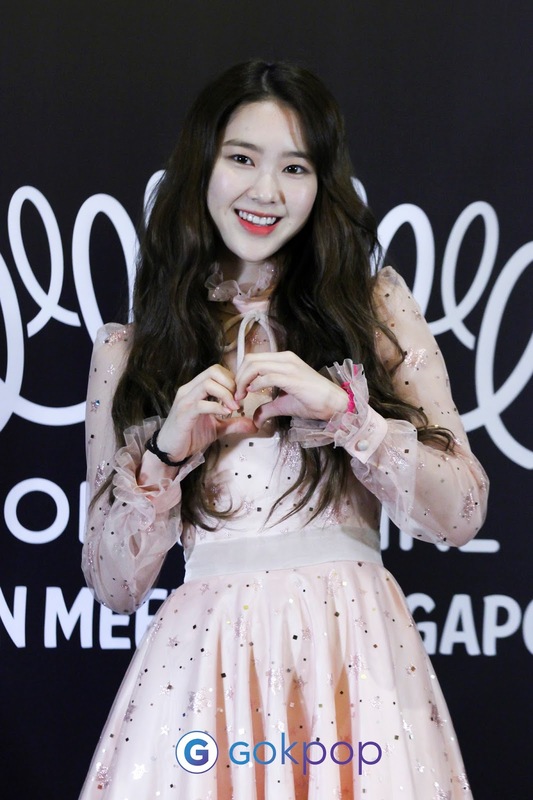 In the K-pop industry, it is filled with many talented artists, and Seunghee had a hard time choosing who she and the group would want to collaborate with. She said that she is open to collaboration with any artist that wants to collaborate with them! We wouldn’t be surprised if the girl group gets several love calls after this! Being a K-pop idol also means that travelling opportunities are open frequently. Hence, Arin states that her handphone, cool patch and pumpkin soup are three essential items that she needs when she travels. As Arin is not good in directions, she feels that having a phone will prevent her from getting lost easily. She also mentioned pumpkin soup as her face swells sometimes, and pumpkin soup helps to keep the swelling down. Although almost half a year is about to past, the girls were asked about their goals, and what they hope to achieve in the year 2018. Leader Hyojung stepped up and told the crowd that she wanted to travel and have a World Tour in the future, while Binnie’s wish was to work hard to wow the crowd during their end of the year performances. However, we are also incredibly proud of the seven-piece girl group for clinching their first win on a music show this year! 2018 is treating OH! MY GIRL well so far and we can’t wait for their future endeavors. GOkpop would like to thank LifeMusix Entertainment for giving us the opportunity for coverage. Head over to GOkpop's social media platforms for more pictures of OH! MY GIRL.